The Cyclone RX is an adaptor for the Amiga range of computers which allows you to connect a Playstation 1 or 2 controller. 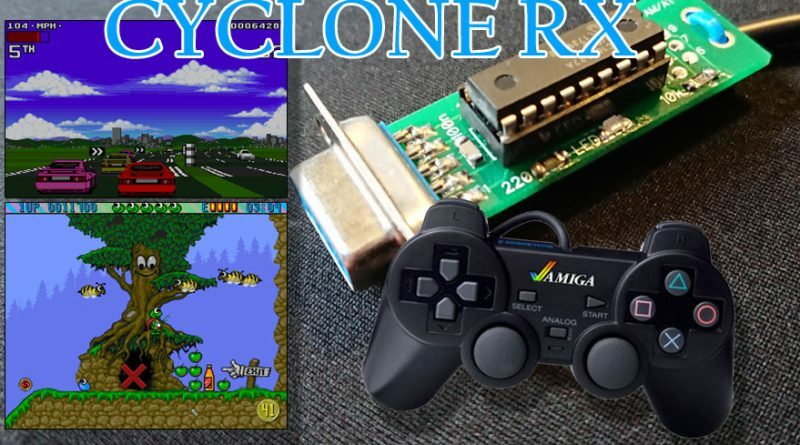 The Cyclone RX should also work with other home computers that use the standard 9 pin D type joystick port. The adaptor is supplied without casing, it is simply a small circuit board soldered to the 9 pin plug. The short length of cable that runs to the Playstation controller socket is held in place by a single cable tie. It doesn’t look like it would be difficult to break one of the solder connections so it might be a good idea to reinforce these wires using a hot glue gun. 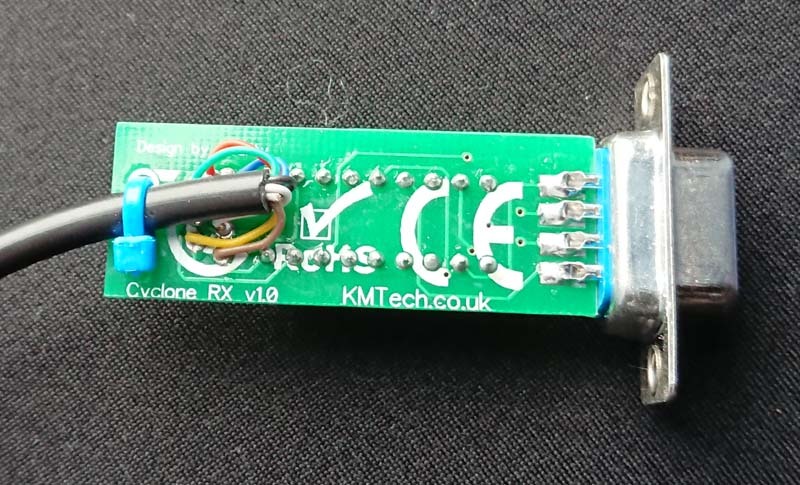 The adaptor itself is about 5cm long with a PIC16F627A 8 Bit microcontroller taking up most of the circuit board. There are a few surface mount components and one blue LED scattered around the PIC. There is nothing on the underside of the board. The PIC can operate between 2V and 5.5V, this is supplied by the joystick port. The Cyclone RX maps the joystick direction controls to the D Pad on the Playstation controller. The fire button is mapped to the circle button, my initial reaction was to use the X button for fire. It doesn’t stop there though as some thought has been put into easing the Amiga platforming need to use up for jump. This has been achieved by mirroring the up and down directional button controls to the L2 and R2 buttons on the Playstation controller, this should make games such as Superfrog and Zool that use up for jump much easier. It also means that driving games which allow you to use up and down for acceleration and braking can now be controlled like pretty much any Playstation driving game, worked a treat for Lotus 2. The designers went on to include support for a 2nd fire button for games that support it and you will also find an auto fire feature which is toggled on and off with the triangle and square buttons. If auto fire isn’t fast enough there is also a rapid fire feature which is activated by L1 and deactivated by R1. If you use the auto or rapid fire features you will want to remember to switch it off when not needed as it can cause you to skip through mission briefings or high score name entering screens. Any analogue controls are not used nor are the L3, R3, Select and Start buttons. A small blue LED is lit all the time while the adaptor is plugged in with the exception of when diagnostic mode is being used. If you suspect that there is an issue with your controller you can test each button in turn. Each button press will light the LED for about a second, no light means you have a problem. You’ll have to reset your computer to exit the diagnostic mode. In use the Cyclone RX has presented no real issues. Gaming feels natural and familiar for those not lucky enough to have grown up with the Amiga and can bring a new dimension of control to those used to using a joystick. There was no detectable lag, in fact I feel as though using a controller makes your inputs a bit quicker and more accurate which is great for those precision platformers. The only drawback with this device is the durability, one good accidental tug on the controller cable could damage the soldered connections. That aside, this is a great piece of kit for any Amiga gamer. Price at time of review is £17.99 ($25.23). It’s strange me to me they would ship this in such a delicate state! I guess it would require a custom case and the fact that this uses a PIC suggests that it might be a home made project. I have had a look for some long 9 pin cases but all those I have found don’t show you the inside so I can’t tell if the board would fit inside.